Sometimes the certification question is really a preparation question: Will this course prepare me enough to work with people with cancer? The answer to that is “Yes.” It is designed to prepare you. Our 32.0 CE hour oncology massage therapy (OMT) intensive builds foundational skills for oncology massage therapy work in any MT setting. If you are prepared to practice, then you can work safely and effectively. You can build your practice and build the trust of your clients, the public, and the medical community. But please keep reading below! Don’t stop at the short answer. Below, we share important information about the various credentials in oncology massage therapy and how to describe them. “Certification” is a poorly understood term. In the US and Canada, there is no certifying body in oncology massage. This means there is no national or state/province-recognized oversight of oncology massage therapy, so there is no formal “certification” to attempt, test into, or maintain. No single educator, instructor, school, or CE provider can “certify” you or issue “certification” after a CE course. Despite the absence of such oversight, some CE providers do, incorrectly, use the term “certification” to describe their longer CE programs. When they do, “Certification” programs typically require hundreds of hours of coursework, tests, longer time commitments, and larger financial commitments. That kind of program is different from a single foundational oncology massage therapy course, taking place over a few days. At Tracy Walton & Associates, our foundational oncology massage therapy course is scheduled over several days. We do not use the term “Certification” to describe our course. In massage therapy, the term “certification” and “being “certified” are often used loosely and incorrectly, confusing a short Certificate of Completion received after a few-day CE course with a longer certificate program, or a true “certification” such as Board Certification from the NCBTMB. Sometimes employers, clients, and other professionals also confuse these terms. Educators confuse the terms as well, in massage therapy but also in other professions. In oncology massage therapy, what really matters? (2) Accurately describing your credentials, even when other people do not. When an employer or client asks if you are certified, tell them about your training and preparation. List courses, memberships, and certificates. Describe your practice and your skills in oncology massage therapy. Read below. Our handy guide describes the different levels of education and credentials, starting with the 32.0 CE hour foundational course offered by Tracy Walton & Associates. 1. The term “certified” and “certification” suggests a higher credential than what you earn in a foundational oncology massage therapy course. To many people, “certification” implies that you passed a test, exam, or assessment. 2. 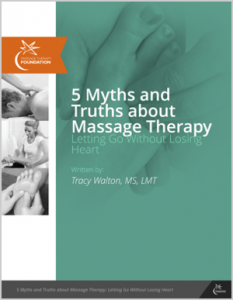 There is no “certifying body” in oncology massage therapy. 3. The term “certified,” and “certification” suggests you have to “keep up” your certification with continued study and reporting CE hours, as in board certification with the NCBTMB. After our foundational course, there is no need to maintain a certification because you are not certified as a result of our course. 4. The Society for Oncology Massage discourages use of the term “certified.” Read their position paper on this. If you have any questions about S4OM membership, please direct them to S4OM at www.s4om.org. 1. There is a “S4OM Pathway,” a pathway of 100 hours of coursework to sit for the Oncology Massage Specialty Exam. 2. As an S4OM recognized educational provider (REP), our courses fulfill some of the coursework requirements on the Society for Oncology Massage pathway. 3. Of this 100 hours, 32.0 CE hours may be fulfilled by our 4-Day foundational course, “Oncology Massage Therapy: Caring for Clients with Cancer.” Another 40.0 CE hours may be fulfilled by our OMT Advanced Mentorship course. We also offer short supplemental courses here that satisfy some of the pathway requirements. 4. Learn more about the S4OM pathway here. 5. Once you have completed the S4OM pathway, you are eligible to sit for the NCBTMB Oncology Massage Specialty Exam to earn a Specialty Certificate. Questions about the Specialty Certificate? If you have questions about the OM Specialty Certificate at NCBTMB, please contact the NCBTMB. At Tracy Walton & Associates, we are not able to answer questions about the specialty certificate. We provide coursework that helps you qualify to sit for the NCBTMB Specialty exam. All eligible coursework from all providers is listed on the NCBTMB specialty certificate site. If you have questions about the S4OM Pathway to the Specialty Certificate, please contact S4OM at www.s4om.org. At Tracy Walton & Associates, we cannot answer questions about the S4OM pathway, requirements, or credentials, or questions about other providers’ courses. Our job is providing our own courses, provided by our staff of instructors. Some of our courses fulfill some pathway requirements. Review our courses here, here, and here. Learn about our instructors here. Note: There is no license in Oncology Massage Therapy. There is no “license” in oncology massage therapy, at least not in the US. Oncology massage therapy coursework will not earn you a license in the specialty. Licenses in massage therapy or bodywork are administered by governments such as states, provinces, and cities. What are our credentials as instructors? At Tracy Walton & Associates, LLC, everyone on our teaching staff is an S4OM Recognized Educational Provider (REP). This means we are part of a small group of educators recognized by the Society for Oncology Massage. The Society established standards of practice in OMT back in 2010. In order to recognize us, they have looked closely at our curriculum, instructors, and teaching methods and confirmed that we meet their standards of education. At Tracy Walton & Associates, LLC, we are NCBTMB-approved CE providers. They evaluate and approve our instructors and our courses. We have been approved since 1999. At Tracy Walton & Associates, LLC, our courses and instructors are approved in some states. You can find the approvals here. Our courses may also be accepted in other states or provinces without formal approval by those states or provinces. Check with your state/province licensing or registration board.